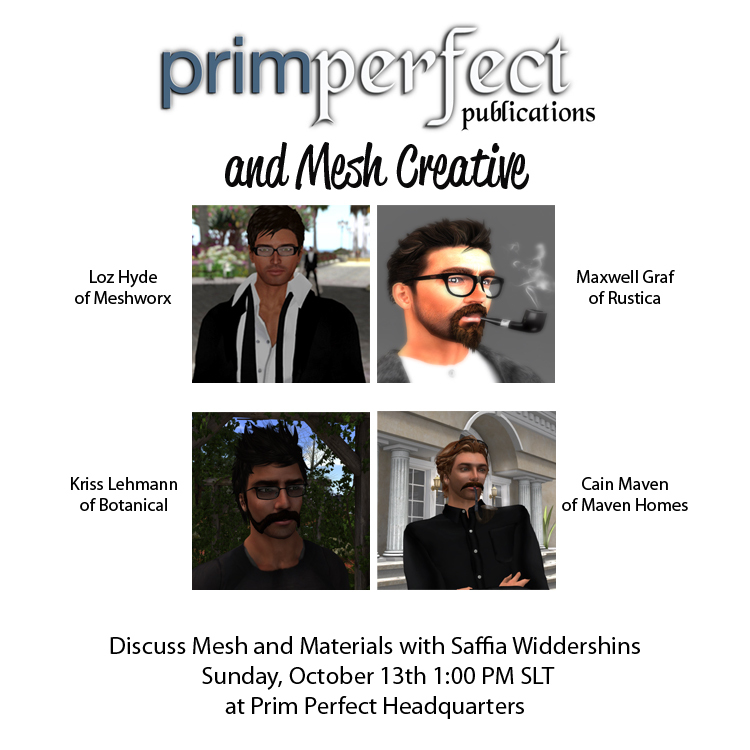 Discuss Mesh, Materials and the changes to the Linden Lab Terms of Service at Prim Perfect Head Offices today! Join us today at at 1pm in the Prim Perfect Headquarters for the first of what we hope will be regular discussions with leading creators. Today we’ll be joined by four of the leading mesh creators who’ll be talking about mesh, materials, and the changes in the Linden Lab Terms of Service. How do they see it as affecting their work? How will it affect you? And we’ll also be talking about elements that they are working on – as well as providing a forum where you can ask questions about creating mesh and using materials as a creator or as a consumer. It’s going to be informative, challenging and a whole lot of fun so do come and join us in the Prim Perfect cafe! Previous Post: Explore the Wastelands with Designing Worlds – now on the web!